Concept - Idée du champicomposteur - Site du champicomposteur ! This is a piece that highlights a gardener's ancestral gesture. A gardener has always been aware of the importance of making compost. This knowledge should be more widely put forward at a time when sustainable development is widely known. In fact, gardeners have simply used the natural process of nature in action. When a gardener is in the forest, he or she will see dead leaves fall, and cover dead branches and other vegetation on the ground. With time, the decomposition process works to provide food for millions of micro-organisms that eat and digest. The layer of decaying leaves become humus, charged nutrients that in turn give life to other plants, trees and shrubs. This is the cycle of life; the smallest micro-organisms have an important place in the natural cycle and recycling of waste. The simple act of gardening has been forgotten; even rural communities are forced to "collect" green waste at considerable cost of fuel and thus creating pollution. The idea of Champicomposteur is to emphasize the need to promote composting.The compost becomes a piece of mesh that instead of being relegated to the bottom of the garden plays a major role in the composition of space. Putting forward the process of decomposition challenges the viewer by giving it an aesthetic. 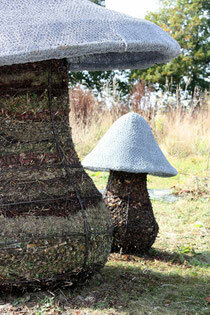 To highlight the importance of micro-organisms, the symbolism of the fungus gives the form a mesh structure. The message is to value traditional gesture by promoting composting to everyone. The mushroom is the symbol of life regenerated: by fragmentation and, organic decomposition; that is to say, this is a transition of a state of death to a rebirth of other living organisms.